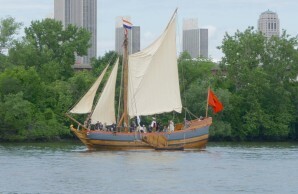 The reconstructed Onrust, built to help celebrate the 400th anniversary of the first Dutch exploration of the Hudson River. Linda Bobar, New Netherland Routes, Inc. Most modern cities were created over centuries. Beginning with shacks and dusty footpaths, they have evolved into masses of concrete, steel, and glass. In the complex transformations, buildings are torn down and streets torn up, only to be replaced by newer versions. There is a constant process of decay and renewal. As it changes, the city invariably leaves part of its past in the earth. Layer upon layer, the city builds upon the past and in the process occasionally discovers its historic origins. In 1918, construction crews, made up mostly of Italian immigrants, began gouging out the tunnel for the Seventh Avenue line of New York’s subway system south of Times Square. By 1918 the line was in operation and trains were running from South Ferry, the line’s southern terminus at the tip of Manhattan, to the Bronx, some thirteen miles to the north. But in May, 1916, the workers had only reached the site of the present-day Cortlandt Street station, less than a mile from the tip of Manhattan, when their pickaxes struck something more solid than the usually soft earth. As they hastily shoveled the soil away, they could see the partial outline of an ancient ship. The dim yellow light in the damp tunnel revealed the ship’s bow, keel, and ribs protruding, waist high, from the western wall of the tunnel. A broadhead ax blade lay embedded in the badly charred oak; a cannonball, a clay pipe, and some shattered bits of blue and white pottery rested on nearby timbers. The discovery marked the beginning of a search that surfaced sporadically during the next half century and only ended in 1967. It was a search for a key to New York City’s beginnings, of which few signs remain. Except for the explorations in 1524 of Giovanni da Verrazano, the first European to enter New York Harbor, and those of Henry Hudson seventy-five years later, little is known about the activities of the early explorers here. The foreman of the 1916 construction crew was James A. Kelly, a short, dapper Irishman with quick, darting eyes. Like other subway construction foremen of those days, he wore a three-piece suit with a watch chain across his vest when be was working in the tunnel. A vaudeville singer in his spare time, Kelly frequently belted out tunes to his crew, who referred to him as the “singing subway man.” “They’re going to dig a subway to Ireland” was the refrain of one of his favorite songs. Intrigued by finding an old ship eighteen feet below what was then the intersection of Greenwich and Dey Streets, Kelly asked historians from various museums to examine it, hoping they would attempt to excavate it. Some of them speculated that the charred timbers might be the remains of a seventeenth-century Dutch ship, the Tijger, but they were not interested in excavating it. Kelly then tried to save the timbers himself. He lined up his crew along the ten-foot section of tunnel wall and ordered them to pull the timbers out. But the timbers did not budge. He then hitched several mules to the one-foot-square keel; they strained but could not move it. The failure suggested that a considerable length of the ship was still buried. Then, as today, contracting firms placed a high priority on maintaining construction schedules and on keeping costs as low as possible. Stymied by the immovable timbers and pressured by the construction firm, Kelly decided to cut off the keel and bow at the point where it disappeared into the tunnel wall. This section, with three ribs attached, was taken to the nearby New York Aquarium and placed in the seal tank, where it became a favorite obstacle for the seals. Immersion helped preserve the find, for if the wood had been permitted to dry out, it would have soon flaked away. When the concrete walls of the subway tunnel ended any hope of excavating the rest of the ship, Kelly seemingly lost interest in the matter. Shortly thereafter, he gave up subway construction and went into politics, where his activity led to his appointment as Deputy Clerk of Kings County. In 1943 Kelly learned that the New York Aquarium was being razed. To rescue the ship’s section he had first salvaged in 1916, Kelly crawled through a window of the deserted and partially demolished building. The seal tank had been destroyed, but the falling beams and walls had just missed the still-wet timbers. How Kelly got them out of the building is not clear, but one version of the story has it that he dragged the heavy wood down the dirty and empty halls and loaded them into a rented truck. Whatever the case, the timbers were presented to the Parks Department, which gave them to the Museum of the City of New York, where they can be seen today. Perhaps this second near loss of the timbers jogged Kelly into realizing how vulnerable they were in the face of progress. Acquaintances of Kelly recall that after this rescue he expressed a great desire to have the remaining part of the ship excavated. Proud of his discovery, he grew extremely irritated if anyone belittled its significance. It was not until 1955, however, that Kelly and the Museum of the City of New York took steps that they hoped might lead to the complete excavation of the ship. In that year, the authenticity of the timbers was confirmed when Columbia University’s Lamont-Doherty Geological Observatory dated the wood as being between 320 and 360 years old. The Bethlehem Steel Research Laboratory examined an iron bolt from the ship and concluded that, because of its high carbon and low manganese content, it was probably made by a smelting process used in Europe about 1600. The dating of the wood and the iron bolt and the location and condition of the timbers strongly suggested that the ship’s remains were those of the Tijger, one of the first European vessels to anchor in New York Harbor.